If you’re a sentient semi truck that lives/works in Minnesota, you should be aware that there’s a long tunnel in Minneapolis called the Lowry Hill Tunnel that you’re too large to fit through. Knowing this may help you prevent your driver from doing what this trucker did. He drove through the too-small tunnel, smashing 47 lights in the process. 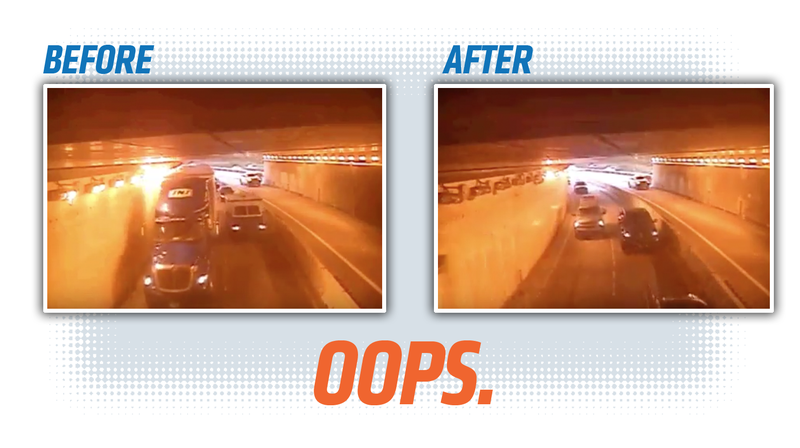 As you can see from the video, the still-unidentified truck with the letters JNJ on the top of the cab is driving in the tunnel, with the upper right edge of the truck methodically smashing the lights used to illuminate the inside of the tunnel. The logo on the truck appears to match the logo of JNJ Express of Memphis, TN. I called the trucking company and spoke with a very exasperated-sounding representative who assured me that the situation was being dealt with, that she could not tell me the amount of the bill, and she wondered how many more people were going to be calling about this. According to the Star Tribune, the MnDOT is looking to replace the lights, but the particular model is no longer being manufactured, making replacement more difficult. In the video you can see that one light from the row survived; the MnDOT should use that one to breed with other lights, since that one has proven to be more truck-tolerant, and may possibly pass that trait down to its offspring.